I wanted to get this out today but to be honest I'm a bit tired...so I 'm hoping there are no typos. 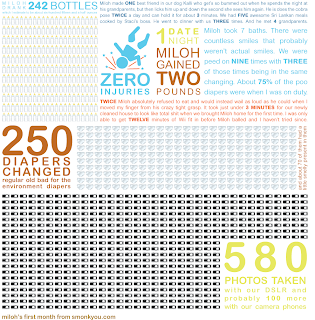 Here is Miloh's first month in numbers. You can click the image to see it larger. This is adorable. Also? Astonishing that you're managing to keep anything resembling a remotely accurate count of any of these. I *love* your week/month in numbers graphics and Mommy is totally jealous that she is not crafty like that and can't make a few for me! This is so cool. Did you design it yourself? Very creative! thanks...yeah I design these myself. The count is kind of easy because at first when we needed to keep track of Miloh's eating because of jaundice from Staci's Gestational diabetes...now we continue to keep a record...it's not perfect but pretty close. And I geek out a bit on info presented like this so that's why I do it...hopefully more representations in the coming month...it takes longer than I thought to do these. this is so cute. I wish I was creative and had skills to put together something like this! i love this. really. a lot. Since some folks on twitter said they would buy one of these for their baby I'm going to work out the logistics of creating them.